As the days shorten and Halloween approaches, you might think the dark hour after a family dinner is best for staying inside, or for going out only on one special night full of costumes and candy with lots of neighbors and friends in the street. But recently our family has been enjoying an experiment with after-dinner outings around the neighborhood, and found it a perfect way to “see” the natural world anew. 1. Try to find the moon. Maybe you pay attention to the moon regularly, but I admit we sometimes ignore it in our well-lit lives. 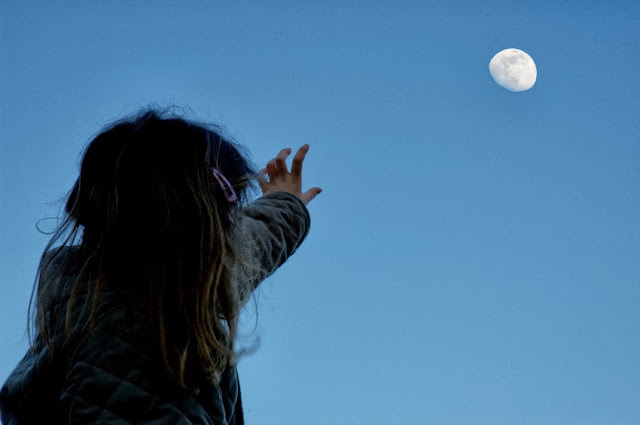 Our daughter loves looking for the moon, naming its phase, and seeing whether it has “moved” by bedtime. If you are far enough away from city lights, you and your kids may also enjoy gazing at the stars and talking about the constellations. 2. Do a daytime activity at night. The other evening, when I realized I hadn’t bagged the leaves we raked earlier in the day and it might rain overnight, I donned a headlamp and gloves and headed for the back yard. My eager young assistant was so noisy and my bobbing headlamp was so unusual that one of our neighbors came out to see what was happening. Walking down a street you usually stroll in the daytime can have a similar energizing effect: Everything seems familiar, but a little strange too. 3. Eat outside. Try bringing your dessert to your porch, or lay a blanket out on your lawn or in a local park. Our daughter loves doing this when it’s so cold she has to wear a snowsuit (and at that time of year, you can be sure the bugs are gone). If you live in a neighborhood with a lot of foot traffic, you may do more people watching than tracking of wild animals, but this is still a great way to get comfortable with the night sounds and sights of your neighborhood. 4. Sit or walk quietly and listen. Can you hear owls? Crickets? Or someone practicing the oboe down the street? Tune in to the sounds of the outdoors. You might even try sitting and closing your eyes together, to show your child how strong our other senses can be when we don’t rely on our sense of sight. Remember your flashlights, and enjoy exploring the night with your kids. All it takes is a few minutes after dinner; no candy required.